I get to run quite a few social advertising campaigns in my line of work, for clients in a range of different industries. Each one targeting a different audience and with different goals to achieve. 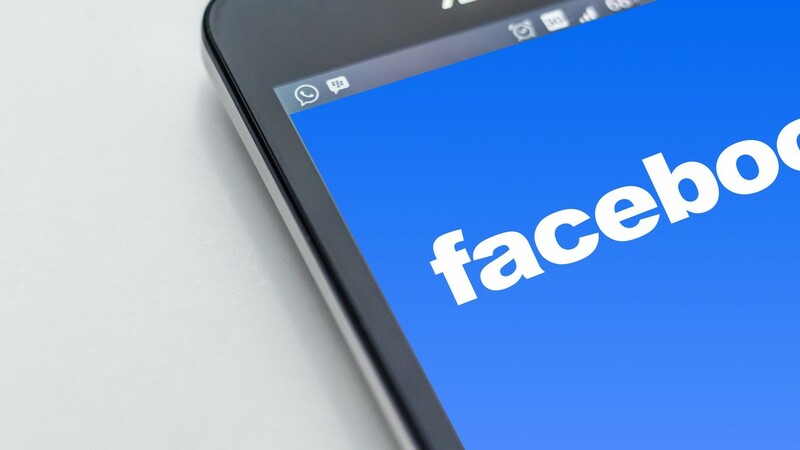 When anybody asks me where they should be putting their advertising spend, 8.57 times out of 10 I say “in to Facebook”. There are many reasons why Facebook is my platform of choice for social adverts. So in the first in a new sporadic series, allow me to present a real world example of why Facebook adverts are better than Twitter adverts. 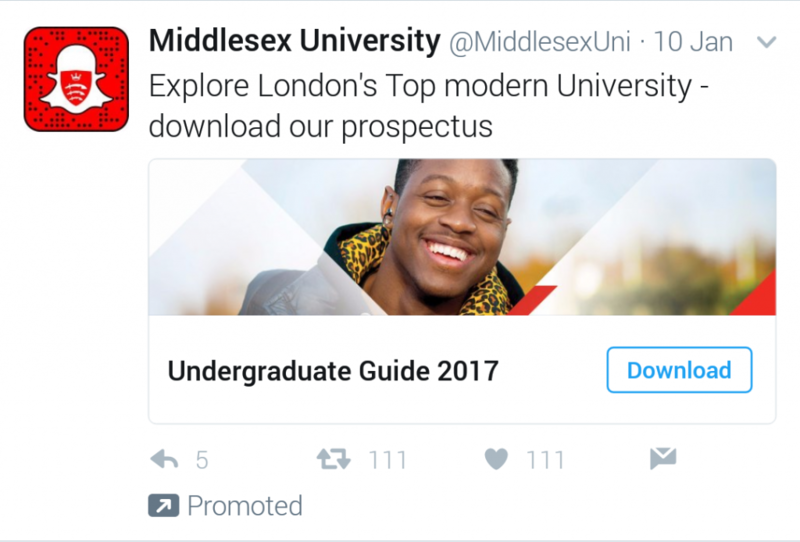 Take a look at this fine example of a Twitter advert from Middlesex University. It’s a lead advert (an ad type soon to be discontinued by Twitter) where a user trades their email address for access to what ever the advertiser is hawking. In this case, Middlesex University’s undergraduate prospectus. Nothing wrong with that advert is there? Easy to understand and gives them valuable contact data to use in future campaigns. So what’s the problem with Twitter ads here? Let’s ignore the fact that this appeared in my feed and I’m out of the target market age demographic a good 15 years or so (Twitter ad targeting is the topic for an upcoming “what’s wrong with Twitter ads” post). Like Facebook and Instagram, with social adverts on Twitter, people can reply to your ads. This can be a valuable tool for interacting with potential customers, or a way of gathering positive feedback on your products. 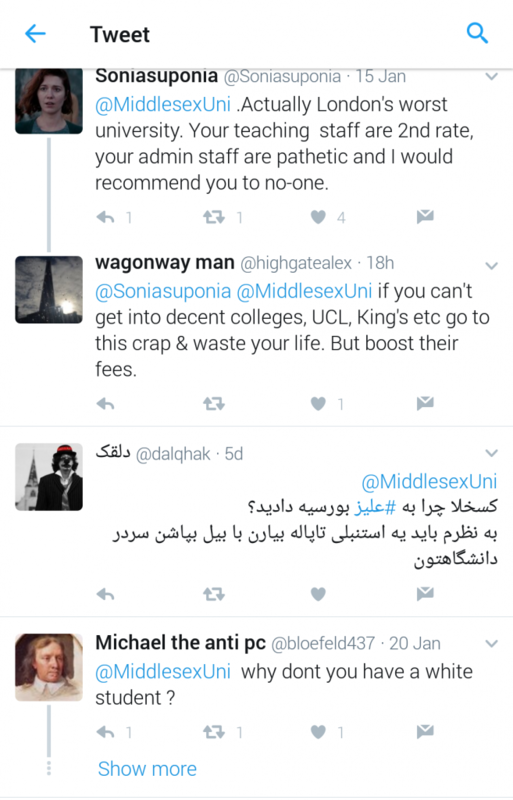 Lets take a look and see what people are saying on Middlesex’s advert. Oh dear. Not the best advert for the establishment. But if people can publicly reply on Facebook ads too, why are they better than Twitter ads? The thing about Facebook is you can easily delete comments you don’t like. Just hit the “x”. Same on Instagram. But with Twitter adverts you can’t easily delete the replies. They just stay there, prominently underneath the tweet that you’re paying Twitter to show people. That’s right, your advertising spend on Twitter can go towards promoting disgruntled customer comments. Not exactly the best ROI for a campaign. Sure you could report the tweet if it’s particularly horrific, but then you’re in the hands of Twitter’s notoriously slow and useless moderation team. So in my humble opinion, easily deleting comments on your ads is just one reason Facebook adverts are better than Twitter adverts. What about you?